Prior to 2004 we always made the Nestle Toll House cookie recipe. They always turned out wonderful - we loved them, until.... September of 2004 changed everything! 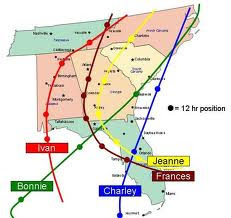 Florida was hit by several strong hurricanes in 2004. Two of these hurricanes came onshore just south of our home within 3 weeks of each other!! The first one, Frances, ripped off many shingles from our roof and we lost power for 2 weeks!! But everyone was safe and the house was intact, so all was good! We hadn't even seen the insurance adjuster and just got our power back on when the next storm was forecast to hit just 3 weeks later! During the storm, Madison and I stayed with Don's parents across town. As a Category 3 storm, Hurricane Jeanne, was the scariest storm in which I had ever been. While I was tucking Madison in to bed, I kept hearing things slam against the side of the house - it sounded like bodies. Really - it did. Somehow that child slept through the whole storm! Why do the worst of hurricanes always hit during the middle of the night?? Anyhoo, once the storm died down my neighbor was checking things out in our neighborhood when she saw most of our roof ripped off on the one end of the house. She is a wonderful friend and has a key to our home, so she let herself in to see what she could save. She wasn't prepared for what she found! It was raining in our house!! Every room!! She was so overwhelmed she had to get our other very good friend and neighbor to help her figure out what to do. Because they know me so well - they had an idea of what to protect and then they called me to break the news. I thought it was a joke...at first, but then I realized she was serious and made the decision to drive home to take care of things. My husband was on search and rescue with the fire dept, so I knew I wouldn't be able to reach him and even if I did - he had a job to do. I had to do this by myself. But seriously, how bad could it be (I thought to myself)?? Although it was no longer raining outside - it was STILL raining in my house! Water splashed onto my legs when I walked down the hall. The walls of my bedroom were sagging (have you ever seen a saggy wall? I hadn't either until then) and the ceiling was thick with water. The only reason our ceilings stayed up was because we had extra supports - otherwise they would have been on the floor. I tried to call Don at work but I couldn't get through. My neighbor drove me to the fire station (bless his heart), and after hearing what happened to our home, my husband's captain called him back to the station. When Don got back there he had no idea what he was going to be told and feared the worse, so it was a relief for him to hear it was just the house - everyone was safe. The guys at the station had already loaded up the car with tarps and nails and other supplies he would need to secure our home from further damage, and his captain allowed him just enough time to come home and make temporary repairs. Firefighters and good friends are the BEST!! Don returned to work and was not able to come home for nearly a week after the storm! This go around we were fortunate our power came back on after just a few hours, but the irony was our home wasn't livable (sigh). The day after finding the damage, Madison and I got to work. I tried calling every contractor I know and every one I could find in the phone book, but they all had enough work to last them 3 years-we weren't the only ones to lose our home in the storms!! I realized at that time we were going to have to do all of this work ourselves if we were ever going to live in our home again! I remember driving down the road with the cell phone and the phone book, and Madison calling around looking for storage boxes so we could pack up what we could salvage. Madison was just 11 years old, but what a trooper! She rose to this challenge and impressed me beyond words! That 11 year old Madison helped me remove all the soaking wet carpet from the house - and let me tell you that stuff was heavy!! It was so full of water!! I remember cutting it and rolling it and tossing it out the window because it was just too heavy for us to carry out the door!! Once we got that stinky carpet out of the house, we started packing up what we could salvage. We made a good team that week while daddy was still at work! Wow this turned into a long story! I need to shorten this up!! Don, Madison, and I worked sun-up to past sun-down gutting the house from top to bottom - everything had to go. And then we worked some more rebuilding our house to what it is today - it took nearly a year of rebuilding (and lots of help from amazing friends and family) to get our home livable again, but when it was all said and done, we were so happy!! After replacing that stove, our cookies were never the same again! We had no idea what was wrong, but our cookies had no bottoms and were greasy!! We thought we were doing something wrong! Should we pack our flour?? That helped a little with how they looked, but they tasted horrible! Should we chill the dough before baking?? Should we increase or decrease the oven temp?? We tried everything! But our cookies never improved. We turned to the internet for help, but nothing worked! It got to the point we stopped making cookies! It was that bad! Then on Thanksgiving Day of 2011 that new stove went crazy and my turkey caught on fire!! I stopped using the oven after that - it was a scary event. I was still using the stove top until about a week later. I was making Red Sauce and there was a pop and a flash! Sauce exploded out of the pot all over everything!! Including the ceiling!! and me - it burned my arm pretty bad. That was it! I realized the oven was trying to kill me. It was homicidal! It had to go! My wonderful husband purchased it for me so it would be delivered around my birthday in January of 2012. We have been very happy together ever since! Because this is a long post I won't go into the induction technology...yet! I will save that for another posting!! hint - I LOVE IT! Madison and I decided to give chocolate chip cookies another try, and you know what?? We weren't doing anything wrong before - it was the homicidal oven!! There was something wrong with that oven from the beginning - it didn't bake anything right! Since we replaced that old, murderous oven we have found an even better chocolate chip cookie recipe. 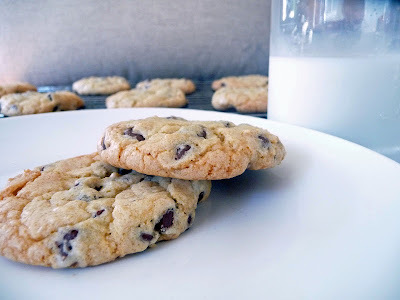 I think it may be the "Perfect Chocolate Chip Cookie Recipe" for which I have been searching. It is beautiful, delicious, and tastes good the next day! 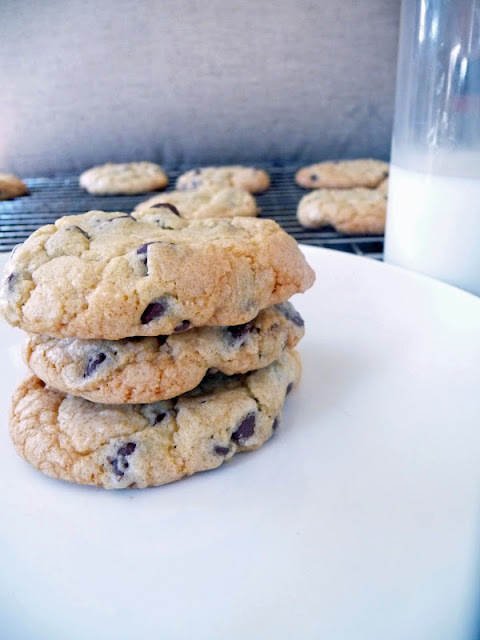 It is crispy on the outside and chewy on the inside - everything for which I have been searching in a chocolate chip cookie! NOTE: I recommend you refrigerate the dough overnight before baking. It improves the flavor tremendously! 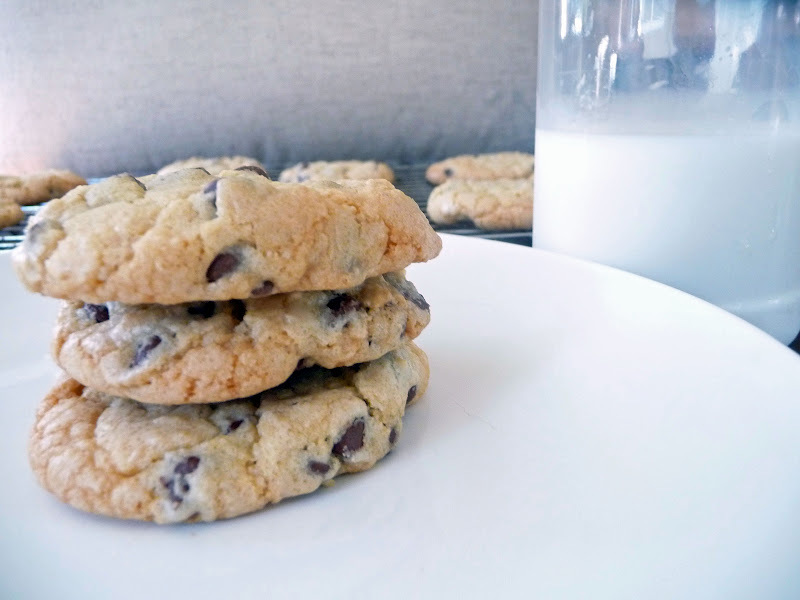 If you just can't wait (like me), go ahead and make one tray of cookies right away and then refrigerate the rest of the dough for baking the next day. Cream together the butter, sugar, and dark brown sugar until smooth. Be sure to mix the sugars and the butter very well or the cookies will be grainy. You want this to be as smooth as possible - not too grainy. Beat in eggs one at a time. Stir in the vanilla. Dissolve the baking soda in hot water and add to the batter along with the cream of tartar and the salt. Stir in flour and chocolate chips just until mixed. If you like nuts in your cookies you would stir in 1 cup of nuts at this time. I measure out my cookie dough using a small scoop. It looks like an ice cream scoop but smaller. Place your cookie dough rounds on a baking pan lined with parchment paper (for easier clean-up). If you don't have parchment paper you can just place directly on the baking pan (ungreased). Bake for about 10 minutes in the pre-heated oven or until they are golden brown with crispy edges. Although these cookies do hold their freshness and are still tasty the next day, I usually make these up one tray at a time. 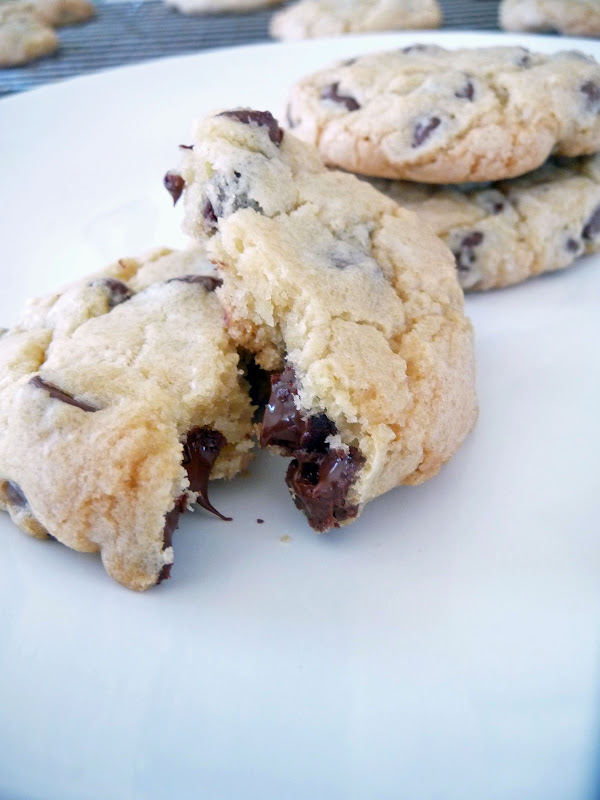 Just keep the dough in the fridge and you can have fresh baked cookies every day until you run out of dough! Man Marion!! We do seem to have paralell lives! Not only did I JUST make that SAME cookie recipe this week, we also lived through those storms with damage....BUT currently have rain pouring in our house...and are awaiting insurance!! Sigh. I think I need another cookie! Seriously, the exact same recipe?? We are so connected! How do you like dealing with insurance companies?? Definitely not my favorite thing to do! I'm so sorry to hear about the leaks - I hope they get fixed soon because it sure has been raining a LOT!! If I ever have a leak in this house again - I think I might just run away. Rebuilding a house from top to bottom is definitely not something I will ever do again! Go get that cookie girl!! Just made these this morning and they turned out super flat :( I even refrigerated the dough over night. Where did this go wrong? Flat cookies make me very sad.Could it be because of so much butter in the recipe? I usually use half shortening and half butter. Oh no! You want to make sure the butter is just soft (room temp) - not melted. OR it may be your oven temp. That is the problem I had with my old oven. This same recipe that was flat and greasy with my old oven, turns out perfect with this new oven that is more insulated. You might have to mess around with the oven temperature. I suggest getting an oven safe thermometer and see if your oven is accurate and then seeing how the temp reacts with a batch in the oven. It is normal for oven temps to drop after putting food in, but it should come back up to temp fairly quickly. If you oven is not sufficiently insulated it might not get back up to temp in a timely manner. You can work around this by raising the oven temperature to make up for that drop in temp. Hope this helps! Let me know if it works for you! Wow, those cookies look fantastic. And you're right. Sometimes the problem isn't with the baker and the ingredients used; the problem lies with the oven. As for your hurricane story, I'm glad you've got good friends who helped you through. Anyone living in hurricane-prone areas are more wary of the state of their roof, especially during hurricane season. People are more likely to get their roofs regularly maintained and repaired because the damages hurricanes do can be quite extreme.